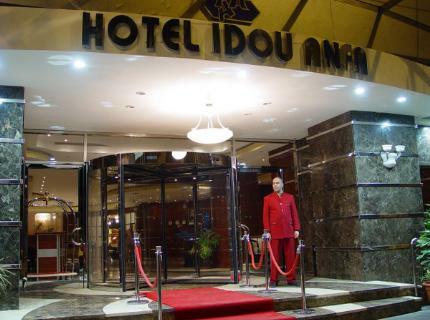 ﻿ Useful Information On Idou Anfa Hotel! This is a three star hotel and is one kilometer away from the city center and 25 kilometers away from the airport and just about 10 kilometers from the beach. It is situated 2 kilometers away from the Hassan II mosque. 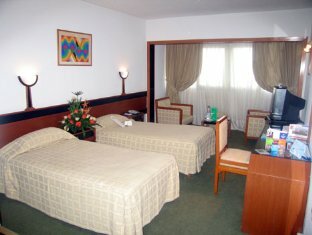 The hotel provides decent business center with seminar facilities and is most popular with the business class travelers. It is a 16-storied building with 220 guestrooms with modern amenities. 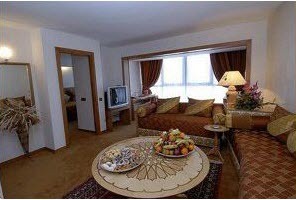 They are elegantly decorated with wooden furniture and floorings are covered with patterned rugs and bright bedding. You can gorge on some tasty cuisines at the d’ Anoual restaurant. There is also an international restaurant that offers great a’ la Carte cuisines. Do not forget the snack bar beside the pool, if you want to munch a quick bite. For the well care of the guests, there is a sauna situated on the 16th floor or the swimming pool to relax your senses after your travel around the vast colorful city of Casablanca. There is even a nightclub, where you may shake your legs to dance till 3 in the morning. Other hotel facilities include car rental facilities, beauty parlor, boutique, coach parking, car parking, and laundry facilities and 24 hours room service.